Best for: Pilates chicks and yoga bunnies who want to take their practice to the next level. Not for: Clubbers, couples looking for romantic solitude and anyone who can’t take the heat. 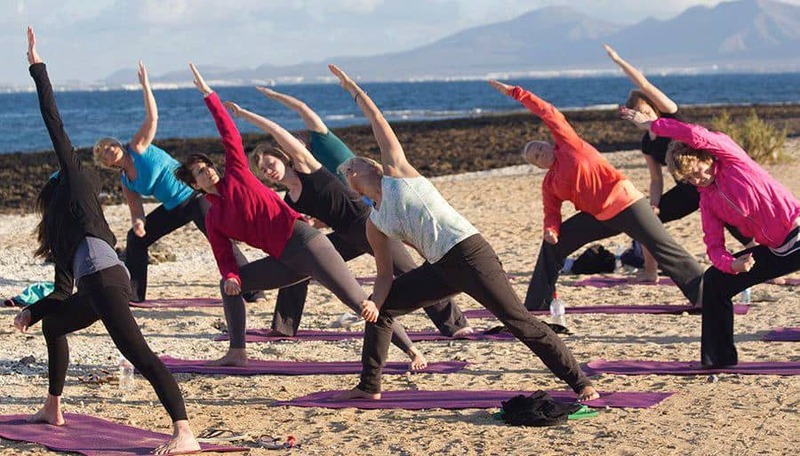 Azulfit offers a range of Pilates and yoga based retreats in the Canary Islands on the sunny isle of Fuerteventura. 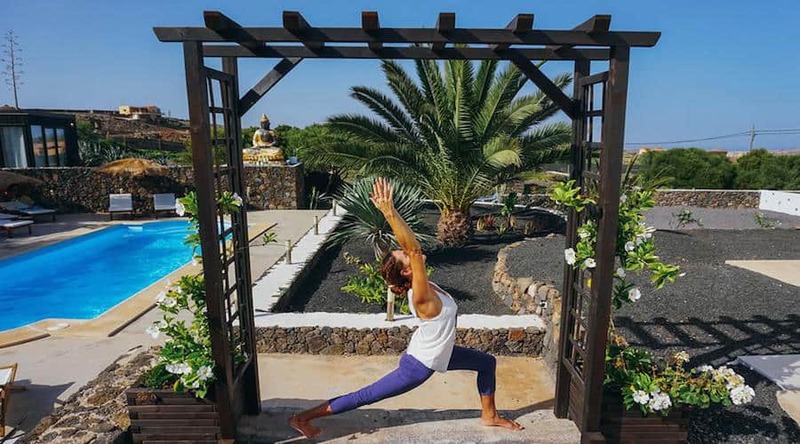 Based at two locations on the island, you can choose a total immersion holiday in the volcanic hills of Villaverde at Surya Retreat with a mix of yoga, Pilates, meditation and nutrition classes, or go for a fun beach holiday mixed with yoga, Pilates and watersports at its sister venue Lotus Retreat in Corralejo. If you’re looking for a healthy, castaway island holiday, it’s perfect. Azulfit has an authentic yogic ethos at the root of both its retreat centres: wellbeing and spirituality run more than skin deep here. The standard of yoga and Pilates teaching is high and the classes are varied, offering meditation and yoga nidra (yogic ‘conscious’ deep sleep) for stress-relief. The vegetarian food is delicious and nutritious and the retreat centres are well-maintained. The limitations of Azulfit are the limitations of Fuerteventura itself and “come with the territory”. Being a desertified island where their water has to be desalinated, guests need to be mindful of water and put up with little inconveniences such as putting your dirty loo roll in the bin, a slight smell of grey water in the morning if you’re in one of Surya’s cabins (the gardens have to be watered with waste water, by law! ); and the occasional power cut. If these things bother you, stick to the mainland. 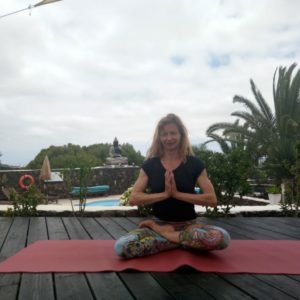 Imogen O’Rorke reviews a week-long retreat at Azulfit on Fuerteventura and finds dynamic yoga, well taught Stott Pilates, super food and quite the best Swedish massage she’s had in years, while Ruth Rosselson reviews a friendly, fitness-focused escape at the same retreat and finds the light-hearted, relaxing retreat is just what she needs. Azulfit specializes in weekly yoga and Pilates retreats at its Surya and Lotus villas and offers a range of therapies; while out of doors there are activities such as watersports and hiking – a great way to appreciate the island’s raw beauty. There are at least four Pilates classes a week. Jo Dombernowsky (long-standing team member at Surya) and Laerke (based at Lotus) are both Stott Pilates instructors and use props carefully for building core strength and precision muscle control. They demonstrate first and offer clear instructions that a beginner can easily follow. Co-founder Jamie Isaac is a certified 2nd Generation master teacher and a teacher trainer for Peak Pilates and does specialist weeks. On a typical retreat there will be a one and a half hour-long yoga class every day. The style varies according to who’s leading: it could be vinyasa flow, astanga, Jivamukti or yin restorative yoga. Azulfit also uses local teachers like Jigyasa Shiv who teaches pranayama (breath work) and yoga nidra (yogic sleep). Teachers can also be booked for private or advanced classes. Look out for speciality yoga retreats with star teachers throughout the year. A massage is included on the signature retreat weeks. At Surya (which has two treatment rooms) you can choose between a couple of therapists who offer Swedish, Ayurvedic and Thai style massage. Extra pampering can be booked on site including Indian head massage, hot stone therapy and 5-Elements, as well as beauty treatments such as Japanese cosmo lift facials, pedicures and manicures. Eating at Surya is a pure pleasure activity. 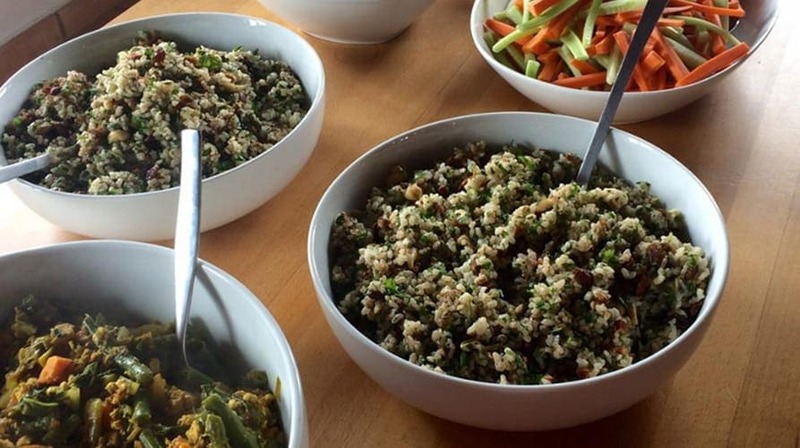 Menus have been devised by resident nutritionist Jo Dombernowsky, whose delicious Ayurvedic-inspired, plant-based dishes use fresh, local veg, superfoods and multiple grains. Her inclusive nutrition workshop is a bonus, which focuses on body type and how to eat your way back into balance. Look out for specialist yoga/Pilates and nutrition retreats. Fuerteventura’s wind and wide beaches offer great conditions for kite and windsurfing, while the surf is always up. Staff can help you arrange courses and lessons, while Lotus occasionally offer combined yoga and surf holidays. Stand-up paddle boarding (SUP) is also an exhilarating way to experience the island. 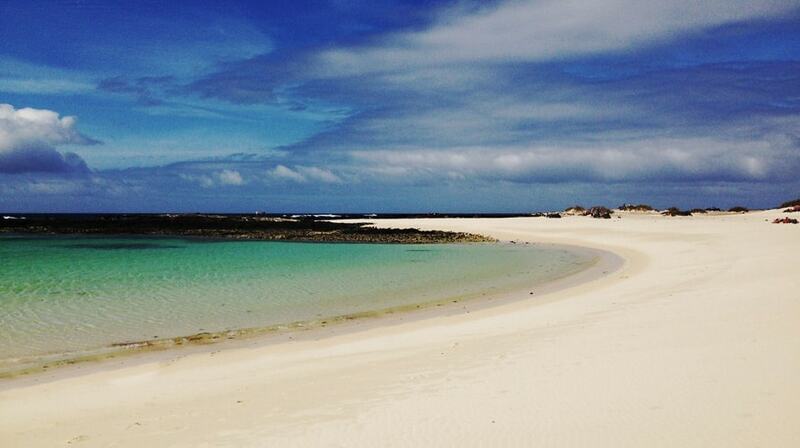 The beaches of Corralejo and the coves around the fishing village of Cotillo are lovely for swimming. 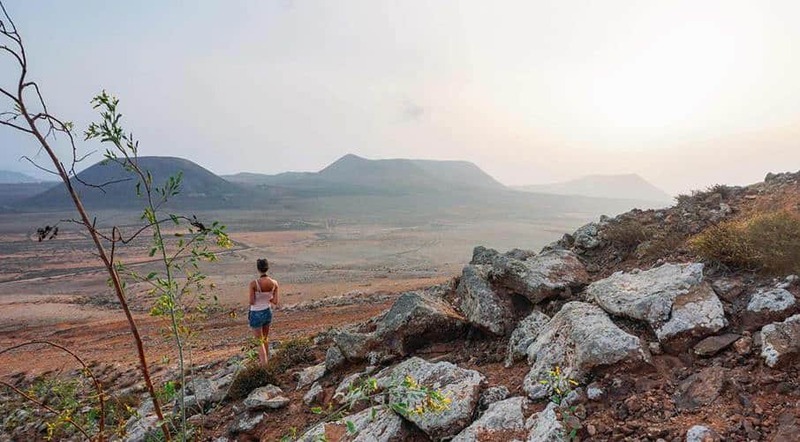 If you’re itching to explore Fuerteventura’s interior, you can hike to the volcanic peaks from Surya, or hire a bikes to explore the striking geological landscape. It is never more beautiful than just before sunset, when the volcanic hills become canvases for the changing light and bathed in rose red. From Lotus, the North shore track will take you to Majanicho and Cotillo, it’s abeachfrontt walk that takes you round into the dunes natural park. Surya: Surya has three types of accommodation: the hacienda-style main building with eight bedrooms leading off a central courtyard. Rooms here are typically Canarian: white-washed walls, beamed ceilings, flagstone floors and ethnic décor and several are en-suite. Mattresses are very comfy (sprung with memory foam on top). 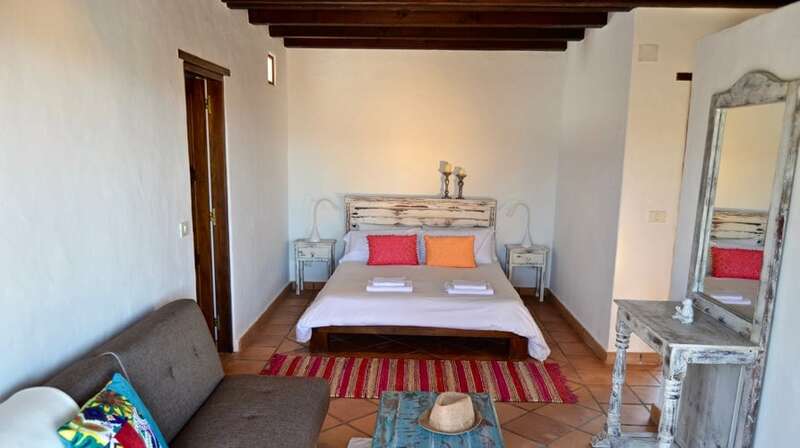 There are three cosy twin bed casitas (cabins) in the gardens and there’s the Zen guesthouse for four people with its own kitchen, lounge and patio. Most of the bathrooms are not shared by more than two people. Lotus: Lotus sleeps nine and has five bright modern bedrooms. The most luxurious is the ocean view suite, where you can wake up to views of palms, beaches and Lobos Island and a deep soaking tub. The first floor has three bedrooms, two twin rooms and a single, with two bathrooms shared between them. There’s also a private en-suite twin bedroom with an external window in its high ceiling. Surya is the location if you want your holiday to centre around the mat and be a proper retreat from the world of noise and commerce. It is 12km from some beautiful beaches, however, making it a little cut off. There are hourly bus services to swimming coves of Cotillo or the coral-white beaches of Corralejo, but if you want easy beach-time and more touristic services on tap, then Lotus will suit you better. The bedrooms surrounding the main courtyard at Surya are cool by design but the shared cabins can a little hot on scorching days and there’s no air con. Luckily, summer on the island is usually attended by a cool onshore breeze and at night the temperature drops right down but keep curtains drawn during the day and doors shut so that the mosquitoes aren’t invited in. Winters at Surya be chilly at night, so pack a sweater/jacket, and if you enjoy walking, take a good pair of shoes. Azulfit is an all year round location and makes a great place for a fun and healthy Christmas or New Year escape (high season). There is surfing all year round, but the best months to catch waves is from September through to March. Spring is sunny and breezy with the wildflowers in bloom after the winter rain, summers are nice and hot with cool breezes off the ocean (May and June are low season), and autumn is lovely, with light winds and warm temperatures. On average there are 300+ days of sunshine per year. Winters are cooler, especially at night but with sunshine most days even if there is rainfall. In both winter and spring the volcanic wildflowers bloom. Summer and fall, the island is more of an exotic, volcanic landscape with beautiful sweeping views of the coasts. There are mosquitos, which tend to increase in numbers in the summer. 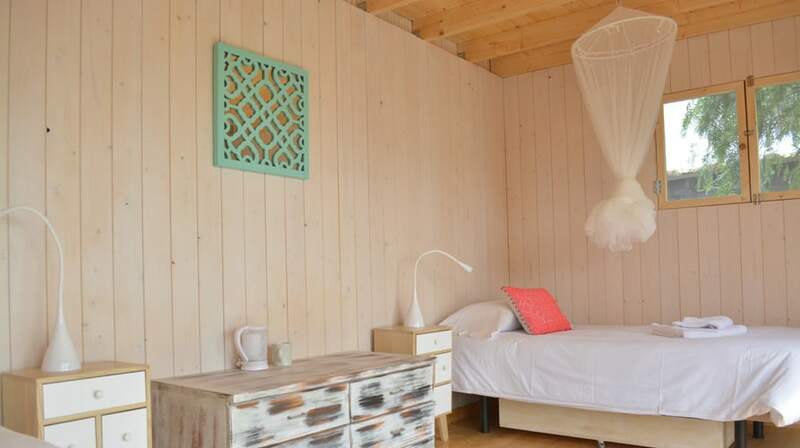 You can buy a natural product made with essential oils at the retreats, and there are mosquito nets in all the bedrooms. In the months where there is light wind, which is usually eight months of the year, mosquitos are rare. Pools and Gardens – Surya: Surya has a lovely 8m long pool and pool terrace with a view across the volcanic hills. It is overlooked by an outdoor yoga platform on one side and a giant Buddha on the other. There are enough sun-loungers and umbrella shades for all and a Bedouin-style tent to retreat to if the sun is too hot. The surrounding garden has been lovingly taken care of: beds of black lava gravel are nurtured into bloom with flowering cactus, aloe, bougainvillea and other succulent plants. A small team of gardeners makes sure everything is watered. Pools and Gardens – Lotus: Lotus has a smaller pool and sun-lounging area surrounded by succulent cacti, tropical garden flowers, and palm trees in a bijou garden. There are some quiet nooks read a book under a palm tree or chill in a hammock. Wahiki beach is a five-minute walk away where you will be likely to do most of your lounging. Morning yoga classes are often taken on the beach before the tourist crowds arrive. Lotus has a large, high ceilinged lounge area, with comfortable sofas and chairs, and plenty of yoga magazines and books to read and skim through. This communal space feels very exotic, with lush garden views, neutral paints, warm colored fabrics and cream tiled floors, and gets filled with natural light during the day. There’s a long dining table and a tea station which is open all day with filtered water, coffee and herbal teas. Next door you have access to a fully equipped kitchen. Outside there are two open-air terraces, where you might practice yoga or meditation in the afternoon, with large wicker sofas, low coffee tables with tea-lights and buddha print cushions. 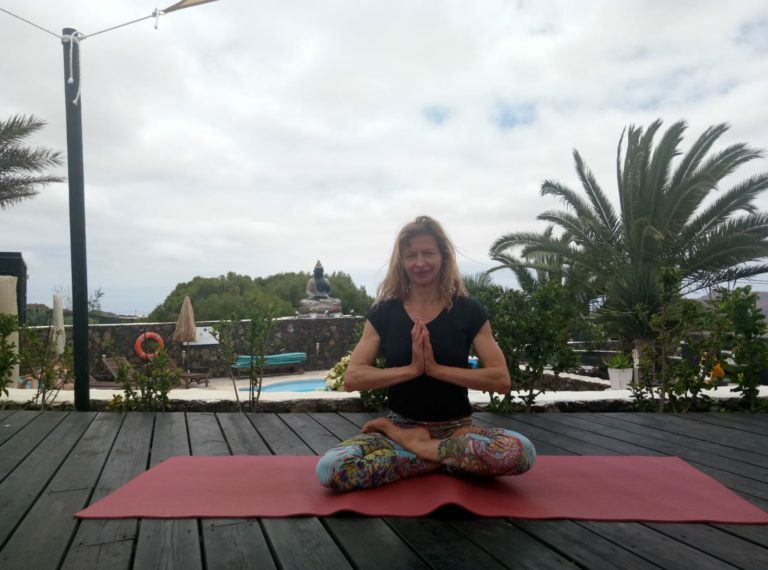 In the mornings, you might practice yoga on the beach, and in the afternoons and evenings, you’ll be in the onsite studio or if the weather is too lovely to be indoors in the garden. Yoga Studio – Surya: Surya benefits from a large, long, wooden-floored yoga studio on the ground floor which provides a beautifully cool sanctuary from the heat of the day. It is well-equipped with Pilates props and reformer apparatus (two pieces) for guests who want to go deeper. Yoga Studio – Lotus: The shala at Lotus is on the lower-ground floor without much natural light (it was once the garage but has been turned into an attractive and cool studio). It is well-equipped with Pilates props. Afternoon and evening classes take place here, while morning classes are often on the beach. Dining Areas: The dining room at Surya is cosy and traditional Canarian with two long tables for communal eating. A range of herbal teas and coffee are always available here but the kitchen is sealed off outside of mealtimes. Food preparation is a big deal here involving up to five cooks who start early in the morning. If you’d like to split off from the group, you can take your food one of the tables in the courtyard or by the pool. 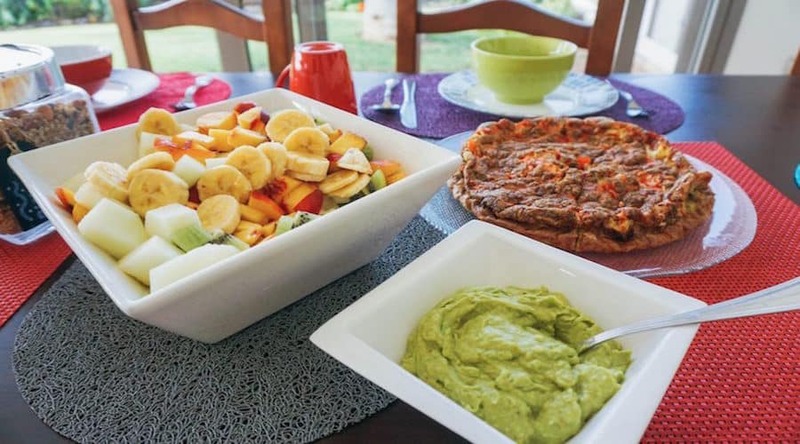 Mealtimes at Lotus are less formal: there is a long table in the main living area for breakfast and you have access to a fully-equipped, self-catering kitchen throughout the day. 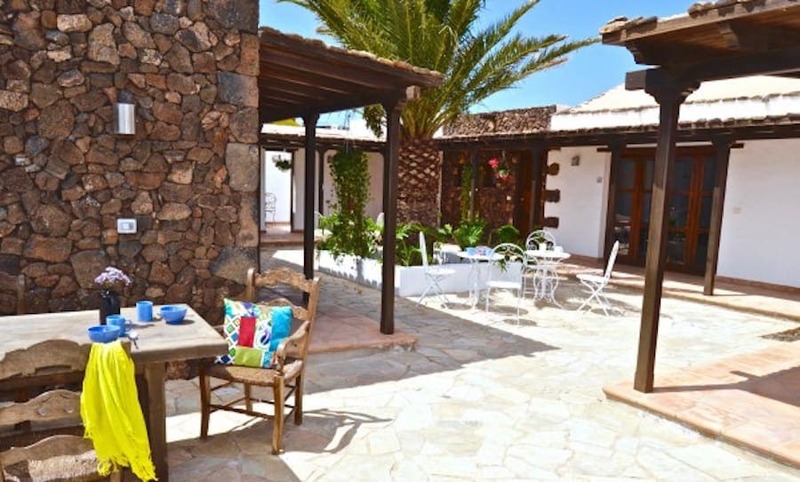 As you’re in the middle of Corralejo, guests are expected to prefer eating out in the evenings. The centre has a list of recommended local fish, meat and veggie restaurants. Breakfast and supper are the main meals at Surya. Delicious and nutritious is an understatement: the vegetarian menu has been exquisitely crafted by nutritionist Jo Dombernowsky. Breakfast boasts a wide array of fresh fruit, yoghurt, homemade granola, ghee, jams, sourdough rye bread and tortilla. There will be salads and savory dishes and various kinds of hummus to pack in your lunchbox to take on an outing. 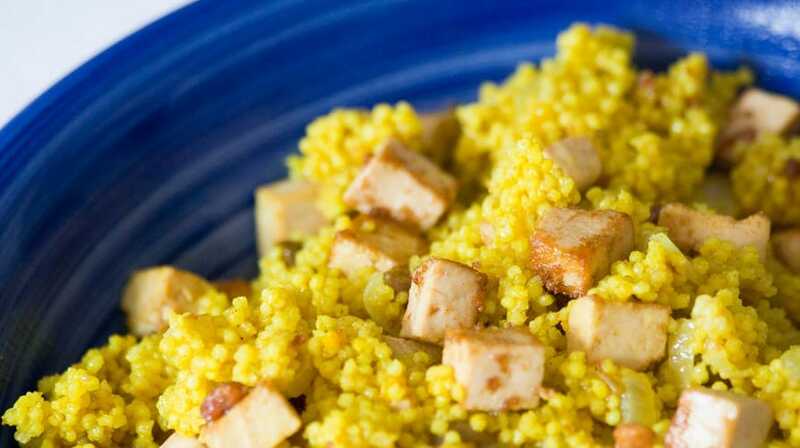 Evening meals are buffet-style with inventive salads, healthy vegan options and Canarian-style dishes like roasted veg polenta. Five suppers are included at Surya Retreat, with an optional sixth, the cost of which goes to charity “Pay it forward” style. Most of the guests choose to go to a local restaurant in Villaverde mid-week to try out Canarian fayre. 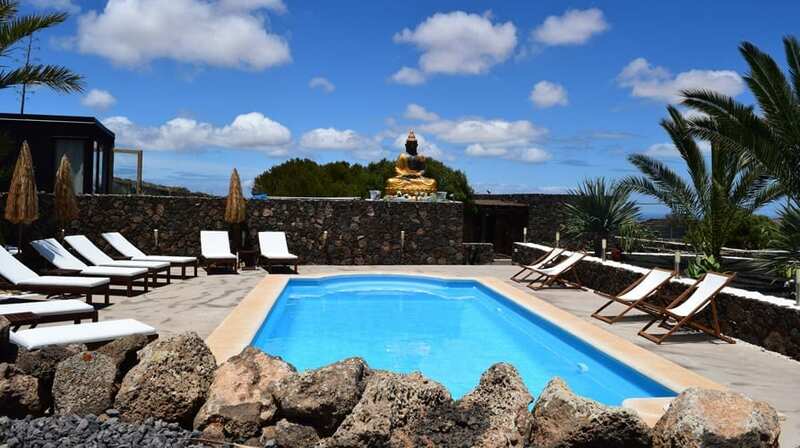 There are two evening meals only at Lotus Retreat as most of the guests will be eating out, choosing from a wide range of local restaurants (there are four vegetarian restaurants alone in Corralejo). No alcohol is served but you can buy your own and drink it with a meal. Both sites also recycle their waste water and use it to water the lush gardens. Herbs are grown in the Surya gardens and they source produce from local suppliers who work with farmers from other islands and mainland Spain. Eggs also come from local “happy” hens. Natural cleaning products are used where possible (mats are cleaned with essential oils, the kitchens cleaned with essential oils and vinegar). Surya has solar panels that heat a large part of the water. 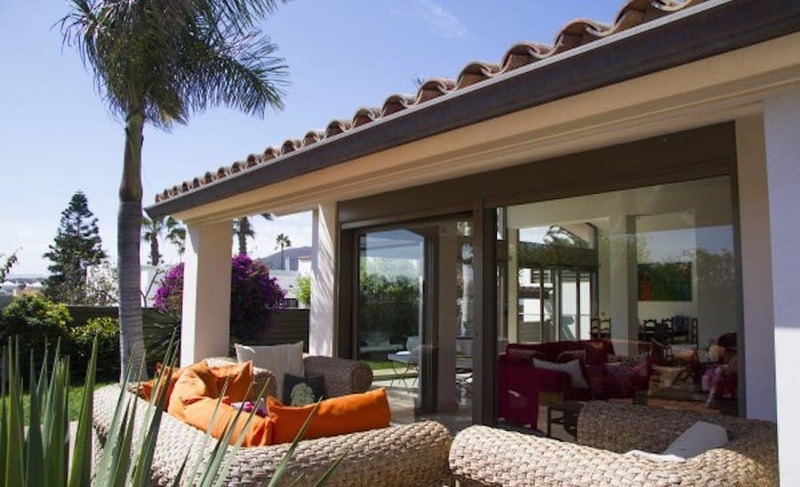 Surya Retreat: 100 Calle Tabaiba, Villaverde, Fuerteventura, 35640. Lotus Retreat: Calle Gallo 2, Corralejo, Fuerteventura, 35660.